Back in the day (that would be the day before we had 2 kids) we used to pack the car early on saturday morning and head off to the Addison Rd Markets to hawk my wares. It was a fun, social occasion, involving visits from friends, Malaysian street food for breakfast, chinese dumplings for lunch, and many treats in between. Occasionally we even made some money! When Oski was born, though, we very quickly realised that doing markets with a toddler and a baby was just going to be a bit stressful and potentially un-fun, so we gave it a miss. And haven't had a stall at a market since. But this past week has seen a flurry of sewing activity, as I prepare for a shared stall with RedPeg at the very lovely Candelo Markets. There'll be all kinds of P&E, including crocheted stubby holders and bunting and handmade cards, and you can get some recycled silver jewellery to boot! So if you're in the area, and feel like getting yourself a springy P&E and some accessories on the first day of spring (yay!) come to the Candelo Markets and visit us tomorrow. All skirts fifty bucks!!! Tell your friends!! Now that's my idea of a party! The common wisdom about owner building is that you shouldn't move in until the house is finished. If you do, it's likely that you'll never finish. Being determined, like I am, I thought we'd be immune to this. A year and a bit in, though, we still have quite a bit to do until our little house is completely 'done'. One of those things is the external rendering. After the mad rush of late-night and all-weekend rendering we did to get the inside finished so we could move in, we were pretty keen to have a break from the old render activity. It is, after all, quite hard, and not that fun. So our outside render remained at various stages of one third to two thirds done - exactly as it was the day we moved in. It's been there, looming on various to-do lists, but always manages to be shafted by something more fun, like planting 800 landcare trees. Now that's what I call a good time! We knew that getting the render finished was going to call for some drastic measures, and that drastic measure came in the form of a render, pizza and beer party for my birthday, thus combining a few of my favourite things: beer, pizza, friends and productivity. Need I say it? Ace balls. Luckily, people seemed keen enough to participate, and we knocked over quite a bit of rendering. Thanks y'all!! Couldn't (perhaps wouldn't) have done it without you! And as if helping render wasn't gift enough, I also got some completely ace presents, including an amazing handmade lampshade (impossible to photograph in all it's light-emitting glory…) Practical Self-Sufficiency, a glorious RedPeg bangle and some handmade pebble buttons, some music, and a peel for the pizza oven, lovingly handcrafted by Brett! Feelin' lucky, I tell you. The pizza part of the party was the inaugural firing of our earth pizza oven. Ok... it was actually the second firing, the first being an abject failure on account of my paranoia about the oven collapsing. Basically, I built a teensy weensy fire that didn't even go near cooking our pizzas. The pizza oven was built using the instructions in the excellent book (it's all you need, really..) Build Your Own Earth Oven. Only difference is, ours is made from a deserted, dismantled (ie. completely trashed with a shovel) termite mound. You see, while humans struggle to get the correct ratio of sand to clay for infallible earth building, termites are expert at it. And as an added bonus, you get termite spit in your mix, which makes for very sticky, malleable, excellent building material. Genius. The door was supplied by some lovely friends, and the door's frame was built by some other lovely friends. The whole shebang is one big lovely-friend fest! Just like the party really, which was fun, and productive and pizza-and-beer-filled, and added another coupla layers of love to our little house, while all our merry kiddies ran wild and played in the sandpit and ate pizza and collected snails. Beautiful. today we made candles with lavender and old candle wax in patty pans. One was in a jar.i made a cat. first we warmed the wax next we poured it in the patty pans. we plaited string to make a wick. we picked flowers. and put them in the wax. we used sticks to hold the wicks up while the wax dried. they look like cakes. i felt happy. I've been trying to make hot compost for a great many years. I've never gotten it right. The usual things have befallen my attempts: pile not big enough, not enough nitrogen, drying out, etc etc. I've read books, I've been to workshops, I've thought and I've talked to people, but still I managed to get it wrong. That is, I got it wrong until I discovered The Secret. And what this secret involved was, for me at least, just a slight shift in thinking, and taking a step towards some other materials that I'd never tried before, namely: chicken offal. In preparation for our entry into the pastured meat chicken biz, I've been getting involved with the co-op. This means working on processing days, which means I get to hone my chicken killing/gutting/plucking techniques, and I also get access to quite a lot of chicken offal. I have to say the first time I brought home those wheelie bins, I was a tad nervous. So many feathers! So many guts and organs! But I did as I'd been taught (oh so many times...) and layered them with carbon (a combo of wood shavings and cut grass from our property) and wet the whole thing down and whaddya know? That baby heated up in NO time. I was thrilled. Encouraged by this success, I thought it high time I embarked upon another composting challenge - humanure. Since we moved onto our land, we've been making use of a commercially-made compost toilet that has a rotating drum, which was supposed to pre-compost the 'stuff' before it went into a compost bay or worm farm (we used the latter). In short, it wasn't big enough for us, and was kind of a pain to empty. 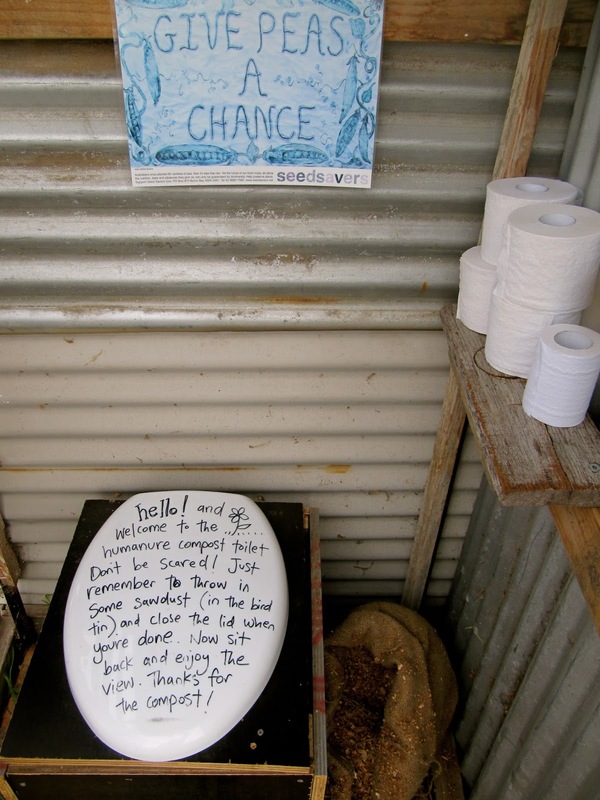 Inspired by the amazing humanure handbook, and the vast plethora of information about safely composting human poo available on the trusty inter-web, I sought to simplify our situation. And it's working a treat. Now before you get all grossed/freaked out (or maybe you are already...), I should say that the humanure compost doesn't go on the veggies. Once it's hot composted for ages, then left to settle for 12 months (during which time worms will work their wonder) it will be applied to the base of our fruit trees in the orchard, then mulched over. Perfectly safe, perfectly legal. And for us, perfectly sensible, given that it means we're now creating a closed loop of waste on our farm (produce no waste! ), whereby 20L/week of nutrients are recycled back into the earth, rather than being flushed out to sea with drinking-quality water. Some people who come to visit are grossed/freaked out by this situation. Fair enough, I suppose. There is a lot to be said for properly-managed disposal of human waste. But there's even more to be said, methinks, for properly-managed recycling of any and all waste. Why not make some cute cake bunting? For me, vake decorating is just another kind of craft. A delicious craft, let's say. For Olive's birthday I decided to make some mini cake bunting, inspired by a picture I saw in an awesome book called Happy Home. Turns out the bunting is really fun and easy to make, and I believe I will be making quite a bit more of it in the future. It's so cute and easy, I thought I'd share my method, so you can make some too! * Fabric scraps cut into triangles (or squares or whatever). I pinked mine across the top so that it wouldn't fray, and also so it was a similar shape to the ric rac. * You'll also need some 1cm wide strips, about 20cm long. * Sew along your ribbon or ric rac using straight stitch on your sewing machine, laying the triangles (or squares) underneath. I made mine in lengths of 4 flags, but you can do as many as you want, I suppose. I left 'tails' at each end, which you can see here. The tails are so you can attach your flags to the 'flag poles'. * Put a little bit of glue or a small length of double-sided tape at the top of the skewer. Glue the 'tail' of your flags to the top of a skewer, and then wind one of your skinny strips of fabric around and around until the tail of the flags and most of the skewer is all nicely covered with fabric. I left about 3cm at the pointy end of the skewer uncovered, so I could stick it into the cake. * Then take the other 'tail' of that length of flags, and join it in the same way to another skewer. This will give you 1 length of flags with a skewer at each end. I actually attached the 'tails' 2 at a time to each skewer, so I could put the flags all around the cake (hopefully that makes sense from the picture). We were all pretty happy with how cute it all turned out, and I'm pretty sure the flags will be making appearances in some fairy gardens into the future. 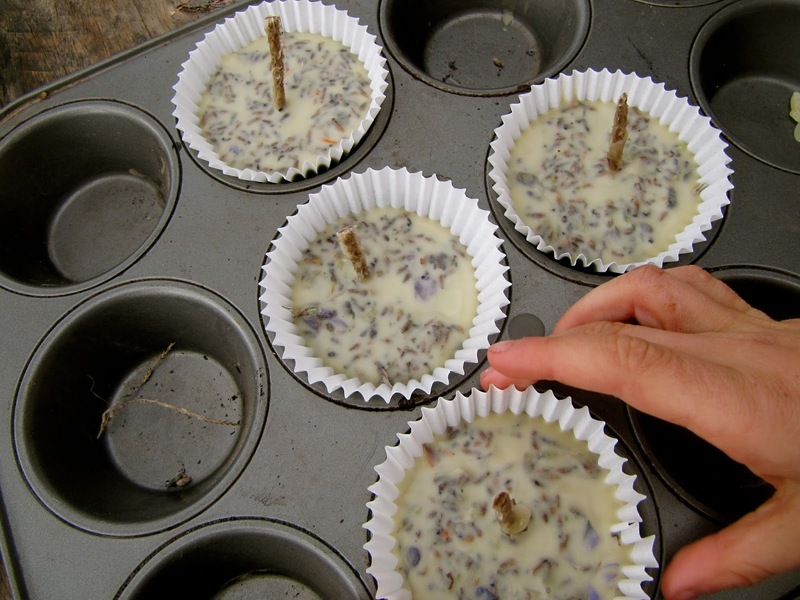 Hip hip hooray for reusable, DIY cake craft!! Almost a year ago, I made the inaugural Bothy skirt for a lady called Siggy. I liked it. She liked it. All was happy times. 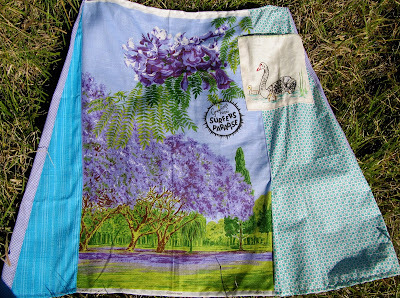 When Siggy read about the teatowel-a-thon, she thought she'd like another P&E, so emailed me requesting a skirt from a still life, or a 'place' Australiana souvenir, featuring the colours purple, pink, teal or green, and a patch pocket. How lovely! Of course, when I read 'purple', I though 'jacaranda'. Don't you? I knew I had a jacaranda teatowel in my collection and had (foolishly, it seems) assumed that it would have been a souvenir of Grafton. Not so. It's actually from that other well known jacaranda hub - Surfer's Paradise. Who woulda thunk it? Either way, it was perfect for Siggy's skirt, teamed with a hand-embroidered black swan (with babies!!!) serviette as a pocket. I don't know about you, but I love the colours. I love the flowers. I love the swans. Today our Olive turned 7. Amazing. While I love making birthday crafts for all my loved ones, making birthday craft for my kids is extra-special. As always, I made Olive a scrapbook of the past year, made from a vintage kids' book. As I stuck the 7's on the front, I thought "is this right? Can she really be 7 already??" It was almost surreal. I've written about the ritual of these books here and here, so I won't repeat myself. I'll just say that these books are treasures in our family, and I feel (I hope!) that as the kids get older, the books will be even more treasured. But the favourite books of the day were the 2 new Ottoline books. If you have an avid reader around the 6-7 years mark, you may be interested to check them out. Olive has been obsessed with Ottoline since Pearl bought Ottoline and the Yellow Cat for her. Olive estimates she's read the book "about a hundred times". She could be right. Even this morning, with crumpets and honey or jam on offer for a birthday breakfast treat, Ottoline Goes to School took priority. Olive's propensity for reading also inspired another of her gifts: a quilted reading cushion. When Oski was in utero, I made him a baby quilt, which now has pride of place on his bed. Olive's always been a bit miffed that she doesn't have a quilt of her own, and I had thought of making her one for her birthday, but her inclination for reading for hours before bed each night made me think that a special, quilted, reading-in-bed pillow might be better. I was pretty pleased with how it turned out. Olive seemed pretty chuffed with it as well. In addition to being a sweet reading cushion, she and Oscar decided it also made an excellent space-travel chair. I also crocheted her a little toadstool, for use in fairy-gardens and other creative pursuits. But probably my favourite gift we gave to Olive this morning was something that was made for her by someone else. This super-sweet personalised O.M.R bangle was hand-made for Olive by the super-talented Gab of RedPeg, who I have already raved about here. The little round seedpod-like ball is a bell, so Olive now tinkles when she moves. The other charm is imprinted with the skin of a seed pod, and stamped with Olive's initials. As Olive says, "it's sort of about me". She loves it, of course. And what else is a gift for but to fill a heart with love and joy? Our work here is done. Happy birthday baby girl. Today marked a year since we moved into our little handmade house. It was a perfect, sunny winter's day, and we all felt happy, and more than a little pleased with what we've achieved in the last 12 months. and ate aforementioned lentil and mushroom ragu while sitting next to the fire listening to the wind in the trees and watching the stars appear. Dessert was stewed fruit with jersey cream. And then we toasted marshmallows. In between all this we rode bikes and walked all around the land, drew pictures, happily read Kim's beautiful blog post about our little nest, made our first batch of kefir, spied on baby kangaroos just learning to hop (there are no words to describe the cuteness), collected fairy firewood, cuddled, read books, danced, swung from the swing-tree, collected eggs and admired the ducks. It was a beautiful, beautiful day, and we felt ridiculously lucky to be living this life.